Music by Igor Stravinski. Sets and costumes by Natalia Gontcharova. Music by Igor Stravinski. Sets and costumes by Alexandre Benois. Choreography by Bronislava Nijinska and Michel Fokine. Music by Alexandre Borodine. Sets and costumes by Nicolas Roerich. Music by Maurice Ravel. Sets and costumes by Alexandre Benois. Choreography by Léonide Massine and Bronislava Nijinska. Music by Domenico Cimarosa (l’Astuce féminine). Sets and costumes by José-Maria Sert. Music by George Auric. Sets and costumes by Georges Braque. Music by Michel Pignolet de Montéclair. Sets and costumes by Juan Gris. Music by Darius Milhaud. Sets by Henri Laurens. Costumes by Coco Chanel. Music by Nicolas Rimski-Korsakov. Sets and costumes by Léon Bakst. Music by Piotr Illitch Tchaïkovski. Sets and costumes by Alexandre Benois. Music by Anatole Liadov. Sets and costumes by Michel Larionov. Music by Vladimir Dukelsky. Sets and costumes by Georges Braque. Music by Igor Stravinski. Sets and costumes by Henri Matisse. Music by Georges Auric. Sets and costumes by Pedro Pruna. Music by Vittorio Rieti. Sets and costumes by Maurice Utrillo. Music by Constant Lambert. Paintings by Max Ernst and Joan Miró. Music by Francis Poulenc. Sets and costumes by Marie Laurencin. Sets by Prince Schervachidze. Costumes by Alexandre Benois. Music by Lord Gerald Tyrwhitt Berners. Sets by Prince Schervachidze. Costumes by Pedro Pruna. Music by Piotr Illitch Tchaïkowski. Sets by Constantin Korovine. Music by Henri Sauguet. Sets and costumes by Naum Gabo and Antoine Pevsner. Music by Serge Prokofiev. Sets and costumes by Georges Yakoulov. Music by Nicolas Nabokov. Sets by Pavel Tchelitchev. Music by Igor Stravinski. Sets and costumes by André Bauchant. Music by Claude Debussy. 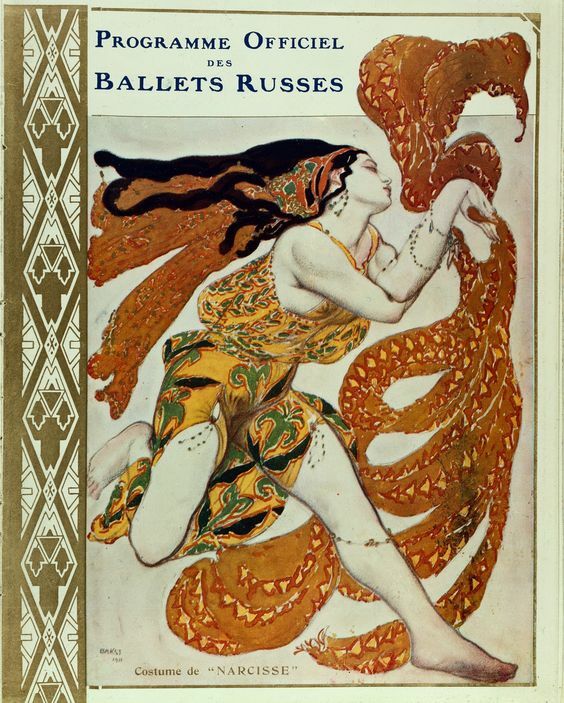 Sets and costumes by Léon Bakst. Music by Vittorio Rieti. Sets and costumes by Giorgio de Chirico. Music by Serge Prokofiev. Sets and costumes by Georges Rouault.